I’m just cranking them out today. 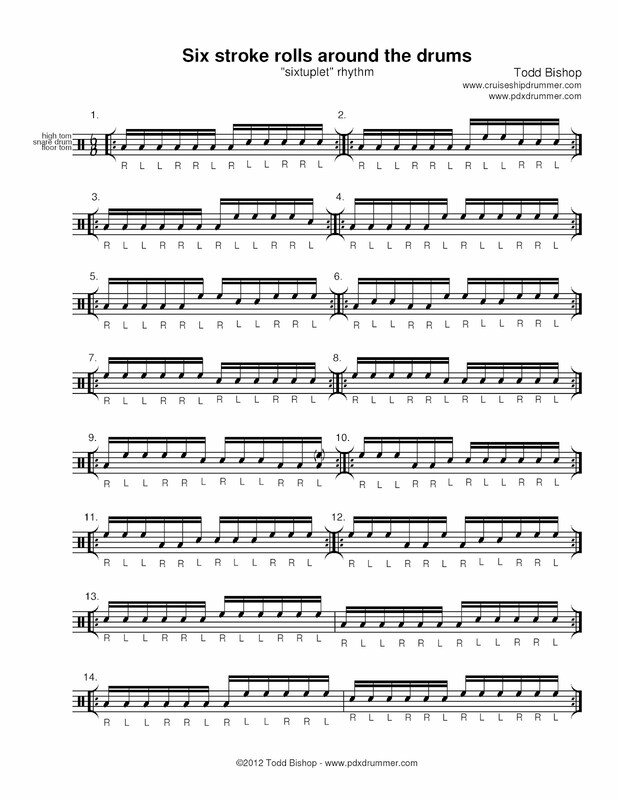 I’ve been using the last paradiddles around the drums thing so much I decided to write up something similar using another familiar solo pattern, the six stroke roll (as it’s often called) in a sixtuplet rhythm: RLLRRL. What they really are is a paradiddle-diddle inversion. I’ve written them in 6/8, but you can play them in 2/4 as sixtuplets, or as 16ths in 3/4, giving a 6/8 feel, or as 16ths in 4/4, for a meter-within-meter thing. Or as triplets within a fast 4/4. I’ll write up an outline of the possibilities when I have the time. This rudiment is usually played with accents on the singles- I suggest playing these with and without them. Refer to the paradiddles post for more ways of practicing these. Oh, and go see Andrew @ the Melodic Drummer– he’s put up some around-the-drums conditioners of his own.